This month, we're expanding our podcast schedule. To this point, we've been picking one author per month to promote, interview, and otherwise honor with the title of TypePad Book of the Month. Well, it just isn't enough. We've got so many great writers using the TypePad platform that 12 per year can't even begin to tell the story. 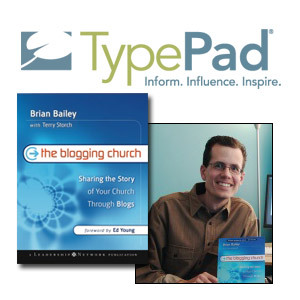 Starting with this podcast conversation with Brian Bailey, author of the newly released book The Blogging Church, we'll be bringing as many authors as we can to this podcast and to the TypePad Bookstore. We recently talked to Bailey about his own experience as a blogger (at Leave It Behind), what led him to write a book about creating blogs for religious ministries, and what surprised him the most about the creative process. You can listen to the podcast (19:56) by clicking on the icon below, or right-click to download the entire MP3 to your local computer or music player.